This is another "old world" recipe that Dad brought over. It's appropriate that Wal supplies the recipe, as he still makes them, and was the only kid of us five who actually loved eating plain, boiled cabbage. 1. Mix together the minced beef, garlic, parboiled rice, onions, bacon, eggs and seasoning. Set aside. 2. Trim damaged outer leaves of cabbage and carve out most of the stem core of the cabbage. 3. Boil or steam the remaining cabbage with the lid on, in an inch or so of water until the outer leaves are soft enough to make a rolled leaf. 4. Carefully remove the outer leaves.. This is quite a tricky operation, as the cabbage is very hot to handle, but you need to handle it. And you can only take off several leaves at a time, before you need to do some more steaming. And the cabbage (i don’t know if you guys have ever seen one) is quite heavy and cumbersome, so not easy to muscle into and out of a large saucepan. 5. Cut out most of the thick spine in each cabbage leaf, so they can fold to a nice roll. 6. Continue to boil/steam more leaves as you go. 7. Place about a cup of filling in each leaf and roll, placing in a saucepan or casserole dish as you go. 8. 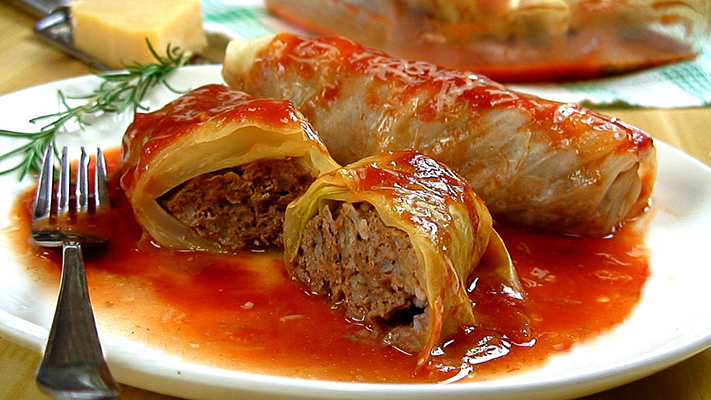 Gently blend tomatoes to a rough consistency, add salt, 2 or 3 teaspoons black pepper, then fill all around and top the cabbage parcels. 9. Gently cook for 40 minutes, until rice and meat are cooked. Serve sprinkled with dill. 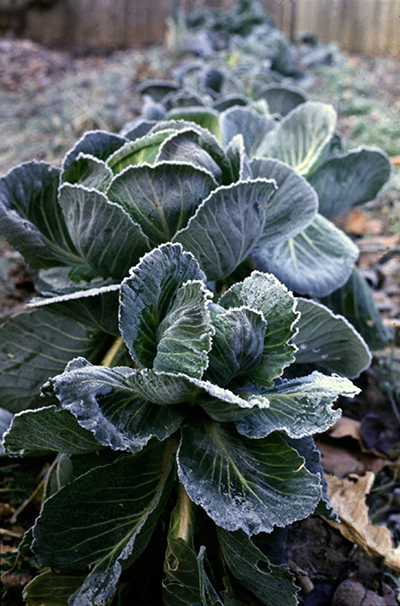 Dad's cabbage garden, around 1978 (note the June frost). Dad would use his own cabbages for his rolls.